Some of you teachers and students out there (those who still get a summer break, anyway!) will know exactly what I’m talking about right now when I mention that feeling you have as you get down to just a couple of days standing between you and a few blissful months of freedom. It gets WAY more difficult to pull yourself out of bed and get ready for real life in the mornings, harder to focus on what you should actually be doing versus thinking about your summer plans, and is just generally an exciting time. Highways - something we won't see much of this summer! That’s pretty much how we’ve been feeling lately…we’re deep into that transition period where your thoughts and energy are both directed toward the future, while you have to continually struggle to stay in the moment at work and other life responsibilities. We’ve both been actively handing off our responsibilities at work, and training colleagues to take over projects that we are working on. I (Erica) am also transitioning my responsibilities as Treasurer of a professional organization to our incoming Treasurer, so that he can at least stay afloat while I’m gone over the summer! In the meantime at home, we’ve been packing gear and making lists of last minute items we need to pick up. We’ve been cleaning house to prepare for my brother to come and watch the pups, cats, and house for the summer (thanks Ryan!). We’ve been working on the ever-growing list of things to do/note about how exactly to care for the dogs, cats, and house. It is amazing to think of all the small things that you do out of habit on a regular basis, that clearly won’t be second-nature to anyone else walking in and taking over your responsibilities (both at home, and at work!). For a control freak like me, it’s going to be hard to let go and not worry that things aren’t going smoothly at home, but I’m sure I’ll find plenty of things to control while we’re out on the road! Another transition that has already begun…cyclist tans! We rode about 35 miles a couple of weeks ago, and came back with awesome tan lines – our knees, arms (but only from short sleeve to our gloves! ), and funky lines on our feet from sandal straps. And this was while wearing 50 SPF sunscreen…just wait til you see what these lines look like by the time we reach the Pacific! And now the “this is the last time we’ll do X until September” things are starting to happen…last time we’ll mow our lawn tonight, last time eating at our favorite Chinese place down the road (where they embarrassingly know our orders by heart), last trip to the dog park with the boys, last local bike ride, last time we’ll see our friends…the list goes on. Change is hard – but we know this will be worth it! In case you somehow missed this info elsewhere - we have a couple of great auctions up and running on Ebay right now! All proceeds from these auctions go directly to the Looking Out Foundation via Looking Out Across America (and will contribute to our total funds donated to the foundation on our silly, oversized check presented to the foundation at Raise the Roof in September!). Bid often and generously! Wow - three weeks from today will be our very first pedaling day of Looking Out Across America! Time flies, and we are feverishly preparing for the journey! We've put a lot of effort into soliciting corporate donations and sponsorships lately, but we know that Brandi fans/ATers are some of the most generous folks on the planet - so, we are asking for YOUR help to make LOAA a success for the Fight the Fear Campaign and Looking Out Foundation! We plan on presenting one of those silly, oversized checks to the Looking Out Foundation at the 2013 Raise the Roof event. We want there to be a big, crazy, awesome number on that check! Maybe you just got your tax refund? Maybe you found $10 in your coat pocket as you put it away for the season? Maybe you saved $2 by using coupons at the grocery store this week? If you're feeling generous, and want to help the Looking Out Foundation, click on that PayPal button over there on the right and help them out! We've also been adding those generous people's names to our Sponsors tab (First name, last initial only!). We'd love to see that list grow :) Any donation is appreciated! Other than maybe some minor toiletry items, I do believe each and every last little piece of anything that will ride across the country with us on our bikes this summer is either in our possession or on its way to us! Thank you to all of you generous souls who helped fulfill the rest of our Amazon Wish List! You are the best! We stopped in to our favorite local bike shop (Indy Cycle Specialist) this afternoon to purchase the last of our items - folding spare tires. And...rather than spend twice as much on a tent footprint, we'd like to thank Heather for her fantastic idea of using Tyvek house-wrap! It was half the price of a footprint, and will be lighter to carry, and is now on its way to our house via the miracle of Ebay. 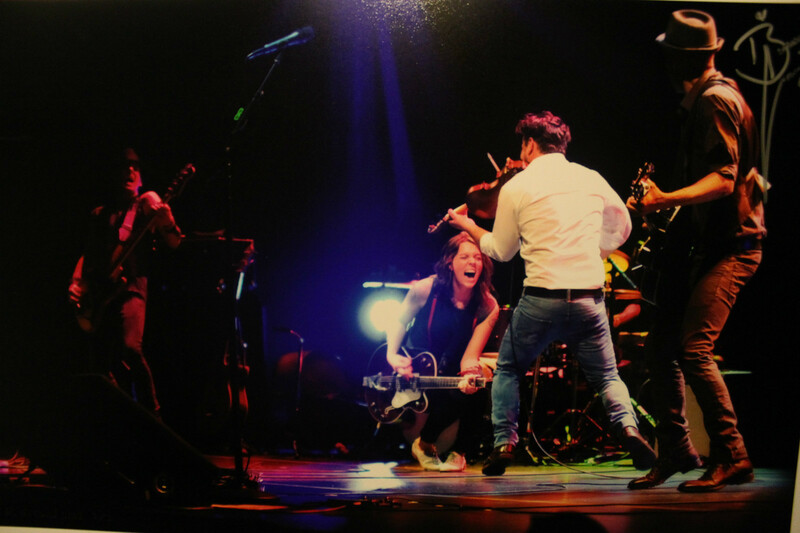 We are excited about this part...we'll soon be auctioning off a really great Brandi Carlile Band print by our talened photographer pal Ruthi David, and autographed by the one-and-only Brandi Carlile! The auction will be Ebay-based, and we'll be sure to smatter social media with it once it's live! In a fun twist of fate, we happened to win the same print autographed by the band at last year's Raise the Roof event - it's been gracing our living room wall for months now, and it is awesome! Our Indianapolis party now has a location! It'll be at the Mt. Pleasant shelter at Eagle Creek Park around 4pm on Saturday, May 25th. Come on out if you can - we only ask that you RSVP on our Facebook page! We'll provide food and drink (all non-alcoholic though - silly park regulations!). There's a playground near the shelter if you have kids. We're still working on a location for our Washington, D.C., but it'll be on Sunday, June 2nd at a bar, most likely. Thinking late evening as of now - if you want to stay apprised of any changes, RSVP to the East Coast Kick-Off party on Facebook! Delawarians...this one's just for you! We have a generous supporter who has sponsored another t-shirt giveaway to cover our final shirtless state - Delaware! You can earn up to two entries per person - by letting us know what state you live in (which is, hopefully, Delaware, if you're entering this contest! ), and by liking us on Facebook. Good luck guys - don't forget to share this with your friends from The First State!